News, Types of plastic, What is plastic soup?, What to do with plastic waste? Amsterdam, January 24, 2018 — Everyday, four shipping containers spill into the sea worldwide. Sometimes, these containers are filled with pellets: oval-shaped plastic granules about a half centimeter wide that constitute the raw material that is needed to produce plastic objects. These pellets are transported all over the world. Last year, on October 10th, there was a violent storm. In the port of Durban, a container ship collided with another ship. Two containers, each filled with 990 bags of polyethylene pellets, were severely damaged. A large portion of the pellets ended up in the sea. 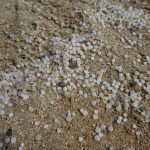 Millions of pellets washed up on the beaches of Durban as a result. The owner of the containership did not acknowledge any liability; he placed the blame on the extreme weather circumstances. Now, more than three months later, volunteers are still cleaning up the washed-up pellets. This is almost impossible because the small grains are now not only widely distributed, but they are often difficult to distinguish from shells. 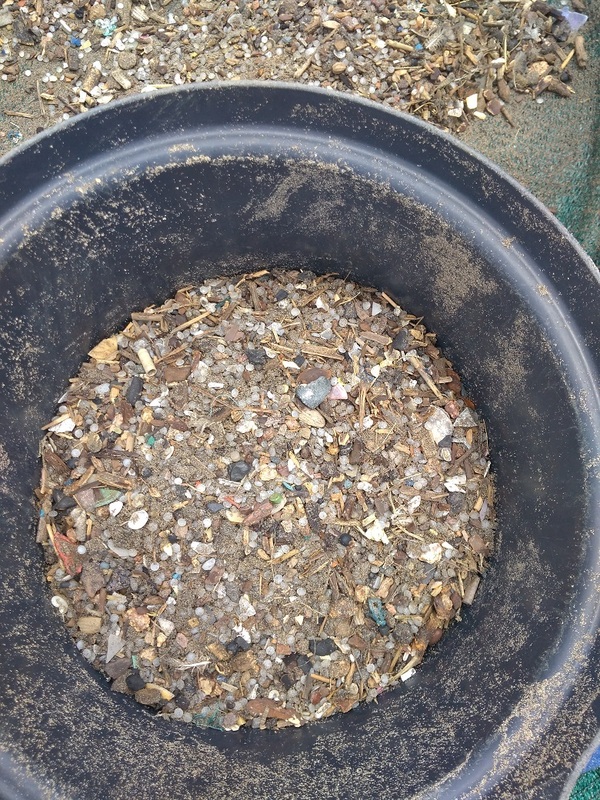 Pellet loss contributes to the plastic soup considerably. The European Commission announced measures against pellet loss as part of its Plastic Strategy earlier this month. Plastic pellet spills are not only of concern during the transportation phase; pellets may leak into the environment during the production and processing phases as well. What measures exactly the commission has in mind are not included. In fact, only one measure is imaginable to prevent a disaster such as Durban; prohibit the intercontinental sea transport of pellets. 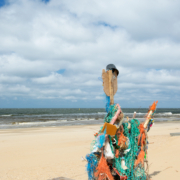 My little plastic footprint, Types of plastic, What can you do?, What is plastic soup? It is nearly July and that means that more than one million people from 130 countries will take the challenge of not using disposable plastic and using alternatives instead. Plastic Free July was started in Australia in 2011. Rebecca Prince-Ruiz started wondering why she had so many plastic items in her house and how she could change this. Her colleagues and friends joined in and a grassroots initiative was born. The idea behind Plastic Free July is to take small steps that could have a large impact. The initiative targets people who are trying to make a difference in their own surroundings or at school and are able to encourage other people to follow their example. The website contains plenty of practical information for people who want to reduce their plastic pollution. A good first step is to download an action picker on the Plastic Free July website. It gives practical tips for 18 categories of plastic products that can be avoided, such as plastic bags, straws and packaged vegetables and fruit. The website also has recipes for making your own shampoo and toothpaste. News, Types of plastic, What to do with plastic waste? 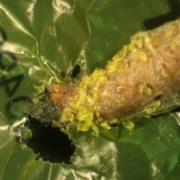 The caterpillar of the greater wax moth is capable of breaking down polyethylene, the most common form of plastic. Researchers discovered this by accident when they put the caterpillars in a plastic bag. The results recently appeared in trade magazine Current Biology. Every minute two million plastic bags are used throughout the world. Most of these bags are thrown away within 20 minutes and end up on a landfill or in the environment. The caterpillars, often used as fishing bait, turn polyethylene into ethylene glycol, a colour and odorless liquid that can be used as antifreeze. The holes started appearing 40 minutes after the researchers put one hundred worms in a bag. Twelve hours later 92 milligrams of polyethylene had been consumed. That is significantly faster than any other organism that is somewhat capable of breaking down plastic, like certain bacteria and fungi. These organisms take around three to four months before dissolution becomes visible. It is still unclear whether the caterpillar digests the plastic itself or if certain substances in the animals intestinal flora are responsible. The scientists think the caterpillars are capable of breaking down polyethylene because of their habitation in beehives and their natural diet of beeswax. The way these carbon chains are built is actually similar to the ‘spine’ of polyethylene. According to the researchers the plastic-eating caterpillars are not the solution to the plastic pollution. However, the surprising research results can provide ideas for future biotechnological applications. News, Types of plastic, What is plastic soup? Edinburgh, 22 February 2017 – Coca-Cola, the world’s largest soft drinks company, says it supports the introduction of a deposit scheme, starting in Scotland. In Scotland negotiations on the introduction of a deposit scheme have been underway for a few years. Up to now Coca-Cola has resisted introducing deposit money on bottles in every imaginable way. The multinational’s spokesperson stated in Edinburgh that the company has examined the advantages of deposits on cans and bottles and will now support the introduction of a deposit scheme in the country: “It’s already clear from our conversations with experts that the time is right to trial new interventions such as a well-designed deposit scheme for drinks containers, starting in Scotland where conversations are underway”. Deposit schemes reduce the amount of litter, are an important way to realize the circular economy and bring down the costs to the community of clearing up waste. 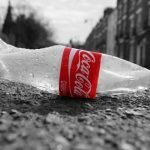 Environmental organizations in Scotland and in England have campaigned hard for the introduction of deposit schemes and welcome Coca-Cola’s new position as an unprecedented key breakthrough. Public pressure on Coca-Cola in England increased in recent months, partly because leaked documents revealed that the company has been secretly opposing the introduction of a deposit scheme. Even Prince Charles got involved in the debate and the Daily Mail started a campaign in favor of a deposit scheme. Up to now Coca-Cola has been able to prevent the deposit scheme from being expanded in the Netherlands, partly thanks to years of fierce lobbying together with a coalition led by the Albert Heijn supermarket chain at the Ministry of Infrastructure and the Environment. According to Coca-Cola Netherlands the collection systems between countries differ and the change of heart in Scotland has no consequences in our country, says spokesperson Arjanne Hoogstad in Dutch daily newspaper Trouw. News, Synthetic fibers, Types of plastic, What is plastic soup? Microfibers from polyester clothing are ingested by freshwater water fleas. Research carried out by the University of Ljubljana, Slovenia, has shown that the fleas died prematurely as a result. PET-bottles are being used as a raw material for polyester clothing. When this clothing is machine washed hundreds of thousands to millions of fibers are emitted with every wash. It’s already known that microfibers from textiles can be found in the environment. Past research has shown that fibers enter organisms such as mussels and crabs. 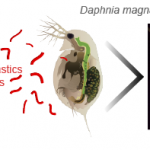 Slovenian scientists studied in how far polyethylene terephthalate (PET) microfibers are ingested by freshwater water fleas (Daphnia magna), a zooplankton commonly found everywhere, and what effect this has. The flea does not select its food so it does not distinguish between plastic and natural food (algae). The fleas which were exposed to microfibers for 48 hours in the laboratory showed a higher mortality rate, especially when they had not been fed with algae beforehand. There was no relationship with the quantity of fibers in their bodies. The length of the fibers swallowed varied between 62 and 1400 µm. After the fleas which survived were put back in clean water for 24 hours, they did not appear to recover. The concentration of fibers was higher than the concentrations reported in the environment. However, the researchers believe that the concentrations could be comparable to places where treated sewage water is discharged into surface water, as these are hotspots with relatively high quantities of microfibers. The results of this research were published last December in the journal Environmental Pollution. Click here for an earlier presentation of this study. Illustration: Biotechnical Faculty, University of Ljubljana.